Just starting to post on Tapas & Webtoons on my second attempt at a web-comic. It is a joke a comic sort of format with an over arching story with some random asides. The story starts kind of normal but will slowly get weirder (threw in a few hints of that so far). I am still migrating things over from the comic's main site, so Tapas & Webtoon aren't the up-to-date comic. Also changed up the order of the parts unrelated to the story in those versions. Any feedback would be appreciated. Aside from the norm for those that visit the main site please let me know of any technical difficulties and such, as I did it myself on Wix and though it is pretty user friendly I have proven many times that it is not idiot proof. Thanks, that is helpful. Though I probably won't retroactively change it I but will try to keep that in mind in the future. Okay, now first of all I don't understand where are you going with it =) You start with the artblock episode, then go to comic, then The Reality Variable, which again has nothing to do with the comic. It is quite boring to read a lot of text about nothing 80% of the time, looking just straight at the same faces ctrl+c/ctrl+v all the time. Sooooomething of the plot actually happened only in episode 10, then again two dudes talking about... something? I'm not really sure if you are using some kind of inside jokes or I just miss the point of their talking. You could сut the amount of you episodes in half and we still won't miss anything. If you want to say something, just say it. Do you have any plot aside of "two dudes smacked a guy and he lost 10 years of memory"? If you do, start unwrapping it =) Also, make these guys DO something, they talk a lot and doing nothing at all, they at least should walk, drink, react in a lot of ways. I've been thinking of separating out the random parts unrelated to the story as different comics. This might push me to do that. I get what you are saying about the art. It is a bit stiff and I need to work on making it dynamic. Still getting used to drawing digitally and it has been a bit of a setback for me. Need to get better at that and not use the crutches I have used to make it easier. Second person to mention the plot, so I have to work on quicken the pace to clarify things. As for the jokes, that's just my sense of humor. Guess I will see if it falls flat for everyone or if some people will like it. get what you are saying about the art. It is a bit stiff and I need to work on making it dynamic. Still getting used to drawing digitally and it has been a bit of a setback for me. That's undestandable =) Small hint: you could try first make sketches on paper and then redraw them digitally. It's not even about the stiffness, it's about variety of angles, use faces not only in 3/4 view, but front and side face and backs, draw from the low and high angle, draw them in full height with some background or concentrate only on face\eyes. It's just more interesting this way. This is a common mistake, but maybe you just didn't notice that. 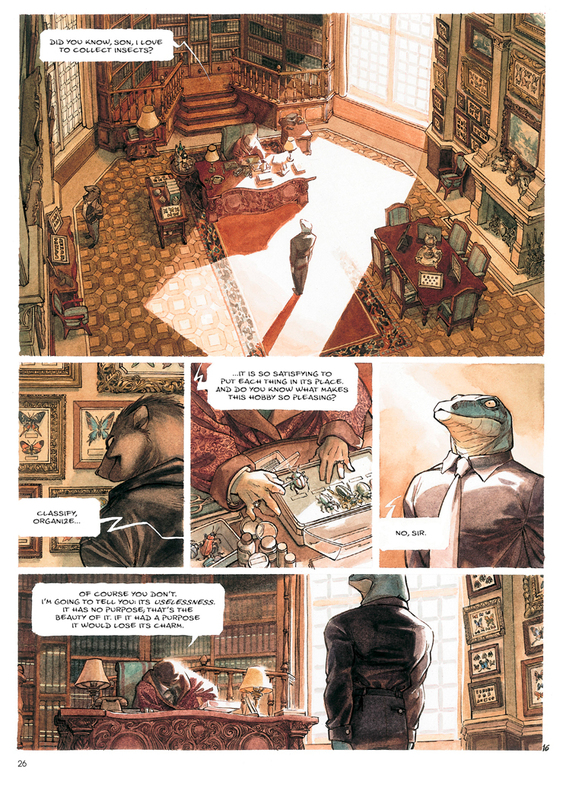 Will leave you a page of Blacksad for better understanding.